Bailey shows strong resistance to disease and is a top performer in home gardens. 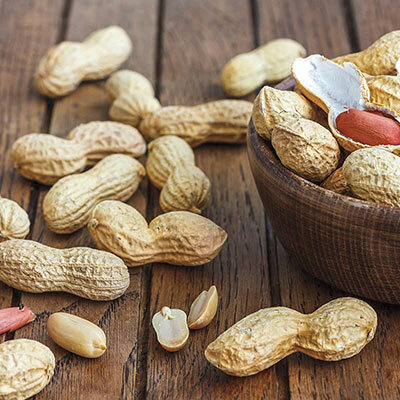 It tolerates a wide variety of weather and growing conditions and has high yields that are good roasted or used to make peanut butter or candies. Peanuts need a long time to grow--plant them when the weather is warm, and all danger of frost has passed. To harvest the crop, pull the peanut plants—roots and all—and hang in a cool, dry location for 7-10 days. Then strip the peanuts from the roots and store them in mesh bags. Treated Seed. 145 DAYS. Spacing: 4-6 inches apart, in rows 30 inches apart. Soil Requirements: Well-drained, loose, sandy soil; avoid heavy clay soils.